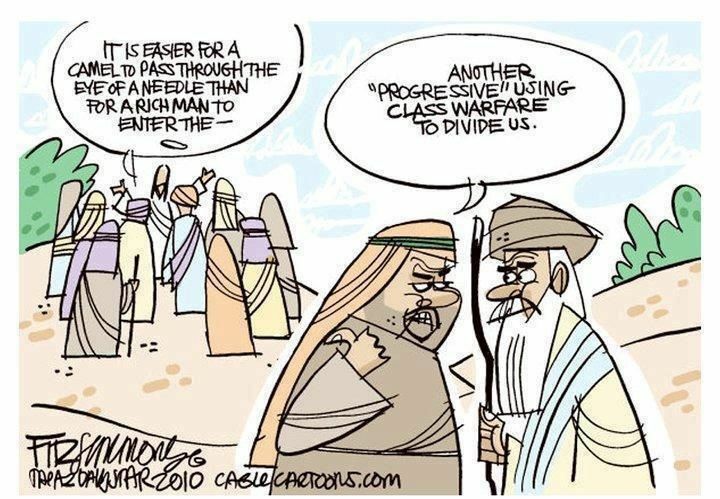 John Hively's Blog: News and Analysis of the War Against the Middle Class | By The World's Most Accurate Economic Forecaster Since 1989. The United States Has the Greatest Number of citizens living in poverty among the industrial nations, according to a new study by the United Nations. This study is likely a dramatic understatement since the United States has the most unequal distribution of income, and the most severe inequality of wealth, which is fueled by the most one-sided distribution of political power. In addition, the study is done using data from the Internal Revenue Service (IRS) and does not count the hundreds of billions of dollars the rich have stowed away outside of the United States, nor the great wealth they hold abroad. The study shows forty percent of the US adults cannot come up with a paltry 400 dollars if it was needed for an emergency. 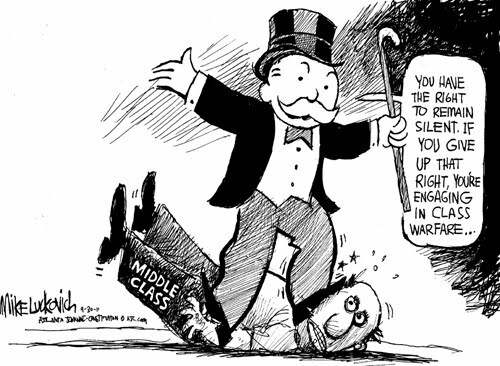 Most of the income and wealth the rich have stolen from the middle class. Lewis Powell was a well-to-do, but relatively obscure, attorney in 1971. He was a corporate lawyer who worked with the Tobacco Institute and various tobacco corporations while they marketed and sold their cancer-causing products to unsuspecting customers. Management knew tobacco use caused cancer and denied it for decades. In 1971, Powell wrote what has become known as the Lewis Powell memo, which advocated a corporate “guerrilla war” of misinformation and corporate take over of our schools, courts and other institutions. That war has been successfully waged. A few months after Powell wrote the memo and presented it to the United States Chamber of Commerce, then-President Richard Nixon successfully nominated Powell to the United States Supreme Court. You already know where Powell’s sympathies lay. He was the rich man’s class warrior. So fast forward to 1978. That year “First National Bank of Boston vs. Bellotti” came before the Supreme Court. The state of Massachusetts had a law banning corporations from spending money in elections. Some corporations sued the state. Although the United States Constitution only provides people with individual rights and does not mention corporations at all, Powell and his other corrupt corporate sympathizers on the court decided to hell with the United States Constitution and nearly two hundred years of legal precedent and argued business corporations had a legal right to free speech under the U.S. Constitution. Powell just made up this corporate free speech right out of thin air, or more appropriately, it was a lie disguised as make-believe, or perhaps you could call it complete fiction. Needless to say, Powell and his fellow non-justices were waging class warfare on behalf of their rich friends when they made this decision. The decision was based solely off the Powell Memo and the needs of the rich to control every facet of the lives of the 99 percent so that corporations could maximize the profits, share prices and dividends of the well-to-do. Corporations are simply ideas, given a legal structure to operate by state law, with limited purposes. They are not people. But they do provide the rich with considerably more legal rights than the founding fathers could ever have imagined or wanted since they are vehicles for organizing rich people’s money into a single powerful entity and using that money to rig the markets for goods, services, finances, politics, and court justices. This was not lost on Lewis Powell and his fellow corporate Supreme Court non-justices. Their decision was based totally on waging war against the 99 percent and on behalf of the wealthy. You only need to read the Lewis Powell memo to understand the truth of this. 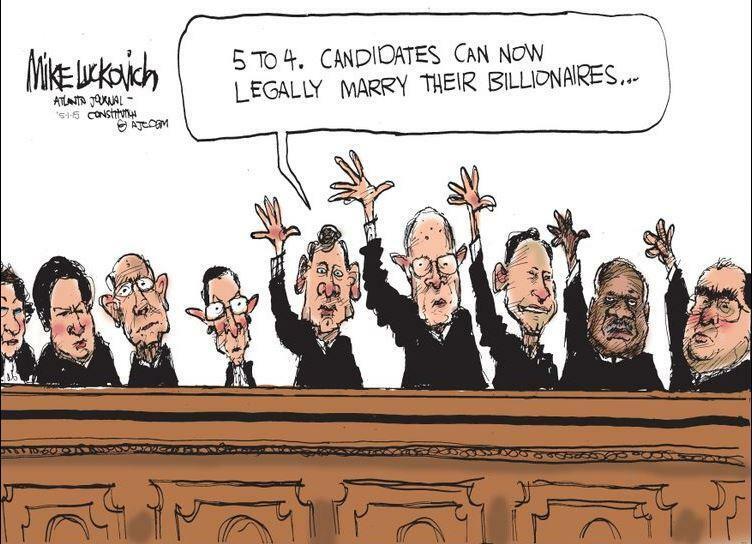 This was one of a series of Supreme Court decisions which have replaced the United States democracy with an oligarchy, and with both major political parties controlled by big money. Lewis Powell completely did what he set out to do, which was to subvert democracy and the U.S. Constitution to the will of the rich. The current representatives of the billionaires on the court (John Roberts, Samuel Alito, Brett Kavanaugh, Clarence Thomas, and Neil Gorsuch) continue their mission of subverting and perverting the US Constitution on behalf of the billionaires and the class war they wage against democracy and the rest of us. The US is dominated by a rich and powerful elite. So concludes a recent study by Princeton University Prof Martin Gilens and Northwestern University Prof Benjamin I Page. So what? Everybody already knew that. Multivariate analysis indicates that economic elites and organized groups representing their business interests have substantial independent impacts on US government policy, while average citizens and mass-based interest groups have little or no independent influence. In other words, the wealthy few determine public policy, while the average American has no power, and very little of it when organized in large numbers. This is precisely why there is little or no movement in government policy in the non-battle against climate change. Yesterday, Senate Democrats largely held together in boycotting what they decried as a “sham” vote forced by Republicans on the ambitious Green New Deal. The vote on the procedural motion failed on a 0-57 margin, with 43Democrats voting “present” to protest the GOP tactics. Just three Democrats — Sens. Doug Jones (Ala.), Joe Manchin (W.Va.) and Kyrsten Sinema (Ariz.) — broke with their party to vote against the proposal for massive clean energy and infrastructure investments to rapidly slash greenhouse gas emissions and attempt to break economic inequality. The rest voted present, including six presidential candidates who co-sponsored the non-binding resolution S.J. Res. 8. Sen. Angus King (I-Maine), who caucuses with Democrats, also joined Republicans in voting no on Tuesday. Quite naturally, Congresswoman Alexandria Ocasio-Cortez railed against the do-nothing representatives of the rich, which can be seen in the video above. Something else needs to be mentioned. The rich own the news media as much as they own politicians like Republican Senator Mitch McConnell and Democratic Senator Ron Wyden, and we the people only get the news and opinions the rich want us to see. Bernie Sanders announced he is running to be the Democratic Party nominee for United States president in 2020. The billionaires who control the national news media immediately began the negative coverage of Sanders. The New York Times, for example, immediately published a story about how incompetent the Sanders campaign had been in getting its message out to African-American voters. CNN broadcast a story about how it will be more difficult for Sanders to win the nomination in 2020 than it was in 2016. The argument is that Sanders is now running against women, suggesting in the process that Hillary Clinton, the most politically powerful female in US political history, was not a woman. Or perhaps the folks at CNN decided to overlook the fact that Clinton was and still is a woman, who raised more money and received more votes while running for president than anybody in United States and perhaps world history. 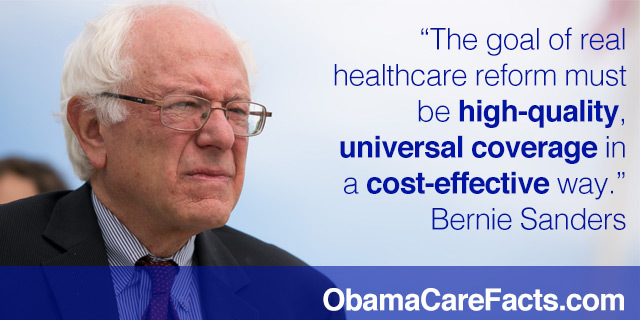 Expect more negative stories and broadcasts about Sanders. The billionaires and Wall Street executives fear Sanders more than any other candidate, with the possible exception of Elizabeth Warren. Expect Joe Biden to become the billionaire /Wall Street Democratic candidate and to enter the race relatively soon. The big money will be behind Joe, as well as the corporate news media. We can expect no less from the billionaires in the race to put a man or a woman of the people in the white house. They will try to stop Sanders, Warren, or any progressive, for that matter. The New York Times and MSNBC are flagships of Democratic Party control, along with other news outlets. The Republican Party wields similar control over such outlets as the Wall Street Journal and Fox News. Wall Street exercises massive influence over all of the above. 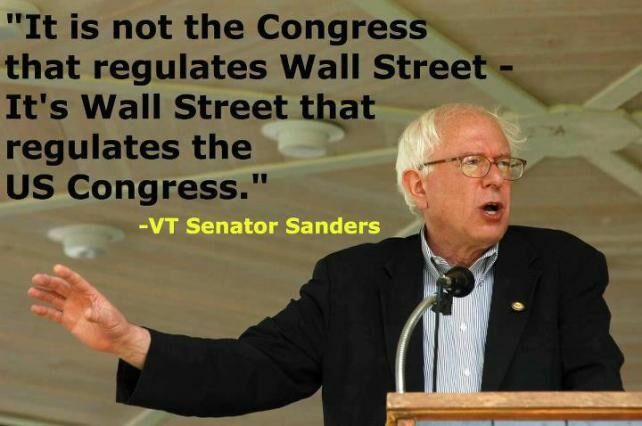 And Wall Street does not want somebody to become president of the United States. Elizabeth Warren is that person. Warren is one of the most pro-99 percent members of the United States Senate, along with Bernie Sanders, Jeff Merkley, Sherrod Brown and a few others. Alexandria Ocasio-Cortez us her closest competitor in the U.S. House of Representatives in this regard. 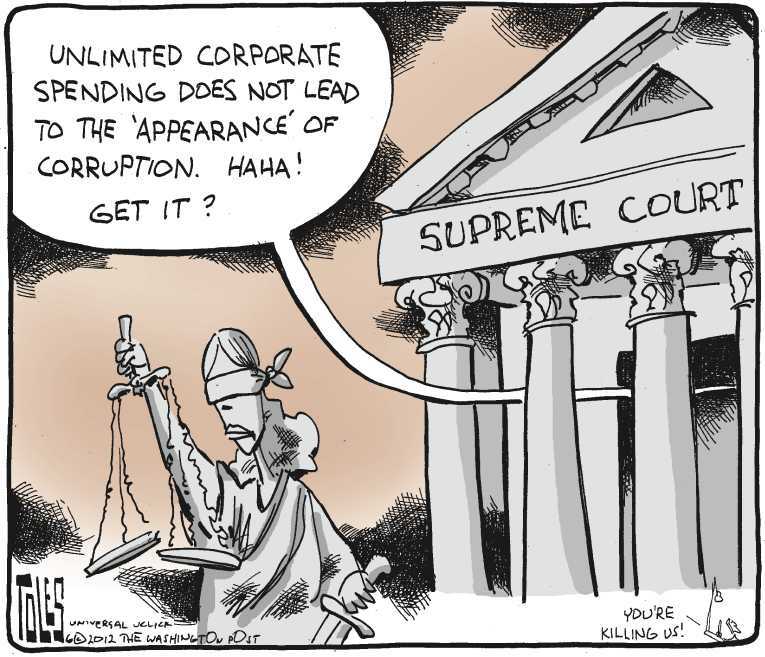 The last thing billionaire Wall Street executives want is a president who will put an end to their corruption of US politicians, end the production of legislation that redistributes income from the 99 percent to the billionaires, and put an end to the massive corruption of the corporate wing of the United States Supreme Court. That is why the Wall Street controlled Democratic National Committee (DNC) and its political weapons of mass misinformation, such as the New York Times, are focusing all of their attention on Warren’s youthful claim of thirty-three years ago that she had Native-American ancestors, which Warren’s DNA test verified six months ago. The intent of this is to discredit and ridicule Warren as a presidential candidate. The real issues, such as income and wealth inequality and the legislation that has brought this about via the massive corruption of all three branches of the United States government, are not being mentioned, and deliberately so. 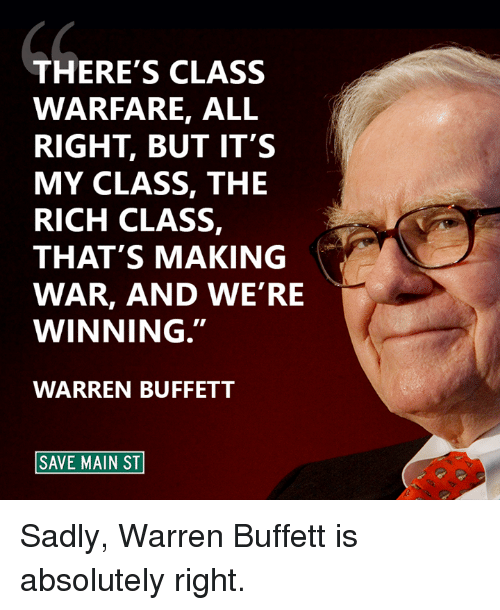 Warren is one of the very best candidates for president the 99 percent and uncorrupted democracy could have and the worst for the billionaires of Wall Street. For example, Warren is the sponsor of the Anti-Corruption and Public Integrity Act. Some of the features of this legislation would eliminate even remote possibilities of corrupting lawmakers and that is a scary prospect for the billionaires of Wall Street who count on that corruption to be able to get richer at the expense of everyone else. A few of the provisions of the legislation are below and notice the corporate news/propaganda outlets are deliberately not mentioning them. • Apply conflict of interest laws to the President and Vice President through the Presidential Conflicts of Interest Act, which would require the President and the Vice President to place conflicted assets, including businesses, into a blind trust to be sold off. • Require senior government officials and White House staff to divest from privately-owned assets that could present conflicts, including large companies and commercial real estate. • Apply ethics rules to all government employees, including unpaid White House staff and advisors. • Require most executive branch employees to recuse from all issues that might financially benefit themselves or a previous employer or client from the preceding 4 years. • Create conflict-free investment opportunities for federal officials with new investment accounts managed by the Federal Retirement Thrift Investment Board and conflict-free mutual funds. All of these provisions would help ensure the restoration of uncorrupted democracy in the United States, but the badly corrupted corporate news media would rather have you focus on other issues while attempting to discredit the author of the above provisions. Corruption clearly extends beyond easy purchases made in the political markets.